Derby, the defending Class 6A champions and arguably Kansas’ best team, has rolled through the first three weeks with an average score of 47-11. The Panthers defeated Goddard Eisenhower (55-20), Goddard (35-6) in one-half, and Maize (52-7). Derby has not lost to a Wichita-area team in the regular season since a 20-13 defeat against Maize South in Week 1 of the 2014 season. The Panthers have scored at least 35 points in each of those wins since, including a 49-14 victory against Hutchinson last season. Derby’s defense collected three interceptions against Maize and limited Eagle running back Dalyn Johnson to 14 carries for three yards, though he did have a 73-yard touchdown reception. Derby led 45-7 at halftime as Dan Dawdy threw for three scores and Brody Kooser ran for three. Kenyon Tabor had five catches for 61 yards and a score. Hutchinson, which had gone through several quarterbacks the past few seasons, seems settled at the position after Conor Craig has remained healthy for the first time in two years. Canyon Maldonado, who played quarterback throughout last season, has moved to linebacker. Hutchinson’s defense permitted just one touchdown in the first two games and the first-team defense allowed just two first downs midway through the fourth quarter in a season-opening 41-13 victory against Olathe East. Hutchinson then won 46-21 at Newton in Week 2. Last Friday, the Salthawks rolled again, 33-14, at Salina Central. Hutchinson, behind all-state lineman and K-State commit Josh Rivas, rushed for 400 yards. That included 149 yards and three scores from Brody Smith, and Tracy Harris (121 yards, two scores). Hutchinson trailed early, 7-0, the only time the Salthawks have been behind this season. Hutchinson has played a softer schedule, ranking No. 31 out of 32 teams in 6A. Derby has played the No. 20 SOS. Derby has won three of the last four meetings, though Hutchinson did earn a 35-28 victory in the 2014 playoffs and a 29-28 win in the 2012 postseason. This is generally a high-scoring, close game. Four of the last six contests are within six points. The winner has scored at least 29 points in every game since Sept. 10, 2004. This is likely the biggest test of the regular season for both teams, and they could match up in the 6A playoffs. Right now, Derby looks close to unstoppable and earns the victory. A feature game in Class 4A-I this week will occur in Independence as the fifth-ranked Basehor-Linwood Bobcats travel to take on the host Bulldogs. This game could serve as a measuring stick for a pair of potential contenders on the eastern half of 4A-I as both project to be playoff teams. The Bobcats, out of the Kaw Valley League, have rolled to a 3-0 start with dominating wins over Bishop Ward, Spring Hill, and KC Turner. Basehor-Linwood has outscored its three opponents by a total of 189-18, or 63-6 per game. The Bobcat offense revolves around senior quarterback Justin Phillips. Phillips has completed 68 percent of his pass attempts for 370 yards and five touchdowns. He has also rushed for 99 yards and two touchdowns on only six carries. The bulk of the Basehor carries have gone to senior Chase Rollo, though he’s only carried 20 times in the three blowouts for 246 yards and six touchdowns. Junior Kaiden McWilliams has added 84 yards and two scores on 11 carries. Senior Eric Scott (6-2, 180) is the Bobcat’s leading receiver with 6 receptions for 134 yards and a touchdown. Scott, also a defensive back, is drawing interest at the next level from programs such as Illinois State, Northern Iowa, Southern Illinois, South Dakota State, and Northwest Missouri State. Junior T.J. Williams leads the defense with 20 stops including three for loss. Independence features an experienced group of 15 returning starters under veteran coach Carl Boldra. Indy opened with a 41-17 win over Caney Valley, a consistent 3A program, before notching SEK League victories over Fort Scott (14-11) and Parsons (27-7). The Bulldogs average 27 points per game, while surrendering just less than 12 per contest. Independence’s most significant win thus far was against league rival Fort Scott. In that game, the Bulldog defense turned the Tigers away three times inside the 20-yard line without points. Meanwhile, Indy’s offense did just enough in scoring on a 56-yard touchdown run by Josh Pralle and a 35-yard run by Will Schabel. Schabel led the Bulldogs in the Fort Scott win with 93 yards on 21 carries. He leads the team with four touchdowns on the season. Schabel went off for 207 yards rushing on 33 carries in the season-opener against Caney Valley. Pralle, the fullback, added 66 yards on just four carries against Fort Scott. Quarterback Colan Snodgrass (6-4, 175) has the capability to throw the ball. He completed 10 of 15 passes for 108 yards against Fort Scott. Levi Kemp is the Bulldogs primary receiving target. 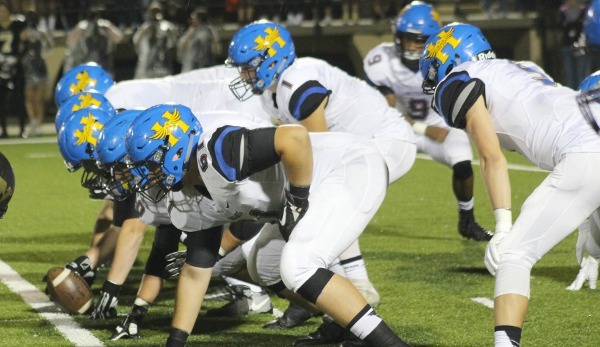 The defense is led by 2015 4A-I All-State selection Peyton Usher-Pearson (6-1, 260) on the d-line. Usher-Pearson has battled some injuries early in the season, but played last week against Parsons. A key Class 4A, Division I matchup in the AVCTL Division III could be the first of two times Maize South and Buhler match up this season. This will be the first meeting between the two schools with Maize South just in its seventh year of existence. Buhler earned a quality Week 1 victory versus McPherson, 26-13, and then held off winless Andover Central, 27-20, before losing 45-21 to Wichita Collegiate last week. The loss ended the Crusaders’ 12-game regular season winning streak, and marked one of the biggest losses under 11th year coach Steve Warner. He is 99-25 at Buhler and 221-86 in his career. Buhler has not lost back-to-back games since a 38-34 loss to Mulvane and a 44-28 defeat against McPherson in Weeks 3 and 4 of the 2012 season. The Crusaders returned four offensive and five defensive starters, led by senior lineman Jake Burkhart. Collegiate led Buhler 45-7 in the third quarter. Quarterback Ethan White has taken over the offense after Buhler graduated talented quarterback Jace Williams and running back Dillon Engelland. Maize South bumped to Class 4A, Division I and has dominated the first three weeks with victories and a combined average score of 46-9. Brent Pfeifer, the only coach the Mavericks have had, has led the team into a new conference and continued success after graduating dual threat quarterback and Army commit Korie Frausto. The Mavs have sandwiched two blowouts versus Circle and KC Washington around a 14-6 victory against McPherson. Senior Ethan Richardson has taken over for Frausto under center. Maize South has posted 8-2, 8-3 and 8-3 records each of the last three falls. The Mavs have averaged at least 27 points per game in the last four seasons, including three times over 31. The scoring defense has risen each of the past three years from 12.2 to 19.6 to 24.4. However, the defense played very well at McPherson against dual threat quarterback Casen Hoover. Maize South led 6-0 entering the fourth quarter when the Bullpups tied the score on a six-yard run from Hoover. Then, the Mavs rushed 12 times for 63 yards and Richardson scored from two yards out. Jacob Perez had 18 carries for 115 yards. Last week, Maize South didn’t allow a point in the first half in a 59-6 victory versus Washington. Perez again led the Mavs with four rushing touchdowns. Maize South's defense continues to play well. Buhler bounces back and plays better, but the Mavs earn the victory. Mulvane will play its third road game in four weeks after a season-opening 52-28 road win versus El Dorado, a 40-20 victory at Rose Hill, and a 61-52 loss last week at home against Andale. The Wildcats rank No. 3 in Class 4A, Division I in offense at 144 points, but are the classification’s lone squad with a winning record that has permitted more than 100 points (109). Andale, which ran for 498 yards, held a 564-411 yardage edge on the Wildcats. Mulvane dual-threat quarterback Jayden Price collected 202 passing and 180 rushing with four scores. The Wildcats had three non-offensive scores with two kickoffs and a fumble recovery. Collegiate bounced back from its 31-22 loss at Hoisington with a dominating victory against Buhler, 45-21. The Spartans, which defeated Rose Hill 41-6 in Week 1, received a big game from junior quarter Cody McNerney. He completed 27 of 41 passes for 316 yards with five touchdowns against one interception. Senior Jad Hourani had nine grabs for 131 yards and a pair of scores. The Spartans, who have a total score of 108-58, have passed on 87 plays and rushed on 88. Collegiate’s 45 points last week marked the most points allowed and biggest margin of loss for Buhler since a 49-19 defeat to Topeka Hayden in the 2014 playoffs. The running game has regressed from the last several years when Collegiate had 1,000-yard rushers Jacques Williams and Nathan Burgoyne. The Spartans have averaged just 3.5 yards a carry this season. However, McNerney, in his first season as the starting quarterback, has completed 55 of 87 passes for 748 yards with 11 scores versus two interceptions. Collegiate has won the last two meetings, 34-14 and 46-18, after Mulvane collected a 47-45 victory in the 2013 playoffs – also the last home loss for the Spartans. The Wildcats will again put up big numbers and won’t have to contend with a running game like Andale. Class 3A’s Hoisington Cardinals and 2-1A’s Washington County Tigers both enter Friday’s non-league matchup with long regular season winning streaks. The Cardinals have won 20 straight regular season contests, including a high-profile 31-22 home victory versus Wichita Collegiate in Week 2. Hoisington went 11-1 last season and tied the best advancement in school history. Hoisington, from the Central Kansas League, has bookended the Collegiate victory with a 44-3 home win versus Kingman and a 41-0 road victory at Hillsboro last week. In the Week 3 win, senior quarter Tyler Specht tallied a career high three rushing touchdowns, and senior running back Hunter Hanzlick tallied 158 rushing yards and scored for the 26th consecutive game. He has 563 rushing yards and seven rushing touchdowns this season. In his career, Hanzlick is closing in on 4,000 yards with 3,955 for his career. Senior Cameron Davis has enjoyed a big jump in numbers with 30 carries for 380 yards and four rushing scores. The defense, led by senior lineman Landen Urban, has been solid, too. In each game, the Cardinals limited the opponent’s offense to under 120 yards rushing and four yards per rush. Collegiate ran 48 plays for 250 yards. Washington County, a Twin Valley League squad, went 10-1 in 2015 and won the first playoff game in school annals. The Tiger’s only loss last season came at Hoisington, 50-6, in the second-round of the 3A playoffs. Washington County has won 12 straight regular season contests. This season, the Tigers, with second-year coach Doug Thompson have played three schools from a wide geographic area: Doniphan West (50-0), Riley County (28-16) and La Crosse (36-14). After this contest, Washington County will face Jackson Heights, Centralia and Troy the next three weeks. Last week, the Tigers broke open a 6-6 halftime tie with 16 third quarter points and 14 in the fourth. Hunter Kier, who led the team with 1,456 rushing yards last season, rushed for touchdowns of 55 and 45 yards. It’s very difficult to play against Hoisington for four quarters, a squad that wears teams down. In the last eight quarters, the Cardinals went 7-21-6-7 for score by quarters versus Hillsboro and 8-0-15-8 versus a powerful Collegiate team. Consistent, physical Hoisington pulls away in the second half. Two ranked Northern Plains League teams meet up in Osborne on Friday. Pike Valley has won a playoff game each of the past two seasons with 5-6 and 8-3 records. This year, the Panthers defeated Lakeside, 54-26, then shutout Thunder Ridge, 48-0, before a 56-8 win against Stockton. Pike Valley, under longtime coach Don Melby, has rushed for 271 yards per contest. Junior Lane Peters is off to another great year with 48 carries for 445 yards and nine scores. He has exceeded 100 yards in every contest. Peters also has 222 special teams yards with a kick return score. Junior Cole Strickler has 23 tackles with two sacks. Pike Valley has also forced two safeties, one by Strickler. Junior quarterback Davante Hammer has completed 12 of 21 passes for 224 yards with six scores versus no interceptions. It is possible to bottle up Peters, who rushed for 1,594 yards as a sophomore and 798 as a freshman. He rushed for 222 yards in a loss to Rock Hills and 180 in a playoff victory against Chase, but combined for 28 carries for 60 yards in defeats against Axtell and Argonia-Attica. Pike Valley is 12-2 when Peters clears the 100-yard mark. Osborne returned virtually everyone from last season’s 4-5 team that both scored and allowed 37.6 points per contest. The Bulldogs have started 3-0 with an average score of 49-6. Osborne shutout Thunder Ridge, 46-0, defeated Beloit St. John’s-Tipton, 50-18, and then blanked Lakeside-Downs, 50-0. The Bulldogs have multiple offensive weapons, including junior Denton Schurr with 40 carries for 376 yards and 10 rushing scores, and senior Cullen Grabast with 36 carries for 263 yards and three rushing touchdowns. Similar to Peters, Grabast and Schurr are both major threats in the returning game. Osborne had two pick-sixes in Week 3, though leading tackler Derek Naegele didn’t play. The offenses are very similar. Pike Valley averages 7.31 yards per play, Osborne 7.39. This marks the first matchup between the teams since 2013 when Osborne won 62-12. Pike Valley won 50-40 in 2012. These are two very even teams across the board. In the end, though, the Bulldogs have a few more weapons and are playing at home. The Bulldogs win in a high-scoring game. South Central (3-0) at 8M-II No. 4 Hodgeman County (2-1) – Hodgeman Co.